When you talk about Ironwork, you’re talking about tools, implements, and weapons that are made of Iron. However, the term also applies to decorative and ornamental pieces; as well as architectural features created from Iron. Ironwork can be made of either Wrought Iron, which literally means “worked iron”, or Cast Iron. 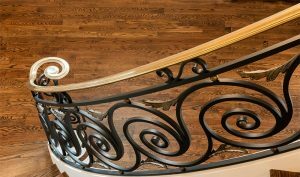 Wrought Iron is forged by a Blacksmith using an anvil and a hammer; while Cast Iron is made using a furnace that has been stoked by several alternate layers of coking iron and poured into molds to fix its shape. Iron has been around for centuries; since around 4000BC, to be exact. The ancient Hittites extracted it from natural ore in order to make weapons; presumably developing the proper techniques for forging metal and tempering it. When the Hittites became scattered, their ironworking techniques and skills spread from Greece to the Aegean region, and the Celtic Expansion helped spread the use of iron to Western and Central Europe by the year 600BC. During those times, Iron was mostly used for tools and for weapons. However, at the start of the 16th century and going all the way up to the 19th century, iron became a decorative material; thanks largely to the efforts of Jean Tijou, who pioneered the fine art of decorative blacksmithing during the late 17th century. In medieval times, iron became the de facto material for ornate grills and screens used to protect the doors and windows of important places such as cathedrals from thieves and raiders. The Baroque and Rococo periods were marked by the most ornate wrought iron in Europe. Spanish cathedrals featured rejeria which were exquisitely-crafted wrought iron screens that sometimes rose up to nine meters in height; while in France, iron gateways, railings, and balconies sported elaborate scrolling and decorations inspired by botanical and religious forms. Then; in 1784, with the onset of the Industrial Revolution and its newfound methods of production, Henry Cort developed the process of wrought iron refinement using the Pudding system which made it possible to create bar iron without the use of charcoal, making iron use more accessible. But the heyday of wrought iron came on the heels of the Arts and Crafts movement: a movement that promoted high-quality, creative, hand-made products that were meant for the common man. This was not meant to last, however, as the 19th century saw the use of cast iron as wrought iron’s replacement: this was because it was cheaper to manufacture. It saw limited usefulness, due to its brittleness, and during the emergence of the Art Nouveau or Jugendstil period cast iron saw wide use in furniture, balconies, and railings. This period was characterized by organic, flowing lines based on fauna and flora; as well as the famous “whiplash” motif. Ironwork continued on until the latter half of the 19th century and the advent of the early 20th century; when it saw a boom and became a perfect complement for the architecture of the time. Soon however, iron was replaced by steel; which became cheaper to produce due to its recyclability. These days, blacksmithing and ironworking is seeing a renewed resurgence, and efforts are being undertaken to continue and preserve this unique and beautiful artisanal craft. Cacciola Iron Works creates, designs, and manufactures custom iron interior railings, exterior railings, gates, and fences that can add a touch of classic elegance to your home. Our over 35 years of experience allows us to offer quality customer service and superior job performance. Call us at 973-595-0854 or send us a fax at 973-595-6712. You may also contact us online for your inquiries and for more information.